$5 from your purchase goes to Democracy Works, a group helping make sure no one misses an election. 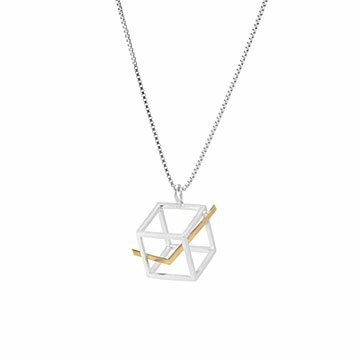 Show your proud support for the right we all have to make our voices heard with this necklace, inspired by the iconic ballot box. The stylish, architectural design is crafted from sterling silver and gold plate, and comes on a card that says, "I'm a voter"— a reminder that yours matters. $5 from your purchase goes to Democracy Works, a nonpartisan organization that helps make voting a simple, seamless experience for all Americans so that no one misses an election. Learn more about their TurboVote tool: you'll receive election reminders, get registered to vote, and apply for your absentee ballot. Made in Los Angeles, California. Show your vote matters with the I'm a Voter Keychain as well. 20" L; pendant 12.5mm sq. The clasp was not problematic for me, but be warned, if you are in a rush you may become frustrated with it. It is a nice concept, great length, goes with everything I have worn (jean, button-down dress or blouses, chambray shirts, tees, maxi dresses). The pendant can be switched out for something more classy if you are attending a business casual event or something more formal. The gold tick is a bit lackluster but it hasn't changed color which I like. The chain itself is good quality and I am impressed. The shipping was quick and nothing was damaged and the packaging is recyclable, which is very important to me. Overall, this is a good gift to give a lady friend, wife, girlfriend, coworker, pixie gift exchange, etc..and it is meaningful. Regardless of party affiliation this necklace is a winner! The necklace exceeded all expectations of pleasing my niece and commemorating her 18th birthday. What could be more symbolic at 18 then earning the right to vote? Only one problem; her friends now all want the same necklace. Hopefully, UG received some additional orders. Great way to get the word out = vote!!! I've worn it several times and had compliments - and I'll continue to wear it after the election. It's timeless. I did have to have a friend put a larger clasp on it, as the one there was too small for me to comfortably put it on [I could, just not easily] but that was only my issue. It's otherwise just fine. Lovely- but includes VERY important symbol!! great gift for my daughter, a passionately devoted VOTER!